Every student in a specific grade (usually third grade, but occasionally second or first) participates in ten, fifty minute, class violin lessons. Symphony School teachers work with each classroom (about 18-22 students at a time) within a school. The Symphony School provides the teachers, materials, and violins. By lesson four, the students are playing on real violins during the class. By the end of this class the student has learned to handle a violin carefully, position the violin, bow and his body, and to properly play. 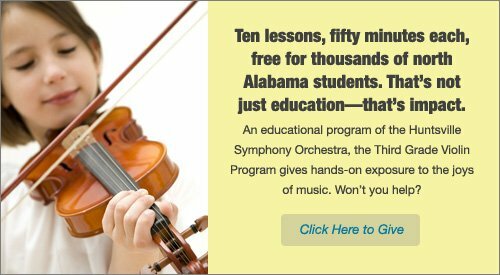 Limestone County, Athens City, Scottsboro City, Guntersville City and Hartselle City school systems contract with the Symphony School to provide this program within the academic day. We also provide this program in a few private schools (by contract) and in most Huntsville City Schools. Upon completion of this program, students frequently wish to continue learning in class or studio instruction programs. Class dates and times are scheduled with each system or school. Availability is limited.